Butter is butterfat, milk proteins, and water. Ground beef is lean cow meat and fat. 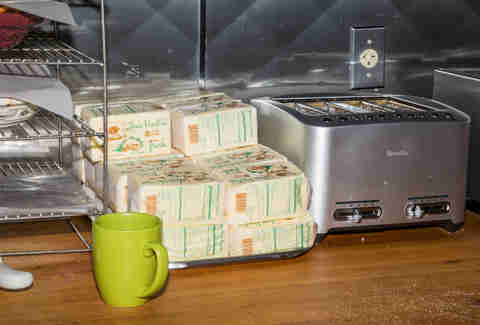 When butter reaches its melting point (90-95°F), it clarifies, and turns almost exclusively into butterfat. And when that combines with cooked ground beef, and the two fats intertwine, the resulting reaction is not so much scientific as it is religious ecstasy. At least in Wisconsin. 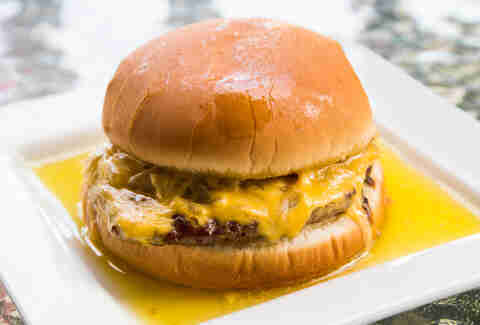 The butter burger (essentially a regular burger with a scoop of butter melting over the meat) is a Wisconsin delicacy. In a land lousy with cow products -- cheese, milk, butter, beef -- the compulsion to combine them for certain glory is all but inevitable. Wisconsin is one of the many places that lays claim to the invention of the burger in America, thanks to “Hamburger Charlie” Nagreen, who in 1885 allegedly decided that it’d be easier for people to eat the meatballs he was hawking at the Seymour Fair if they were between two pieces of bread. His sales song was catchy and involved many rhymes, but for our purposes, only the last two are important: “fried in butter, listen to it sputter.” Judging by that, it’s clear Chucky Burgers wasn’t just a talented songwriter; he might also be the originator of the butter burger. Fast-forward to 1936. Kroll’s Hamburgers in Green Bay opens and features a pat of butter on top of the burger. And that same year, “Solly” Salmon opens a coffee shop in Milwaukee. And Solly Salmon loves butter on his burgers too. Soon, as more and more people adhere to Solly’s burger recipe, the coffee-shop part of the equation becomes less important than the burger portion. 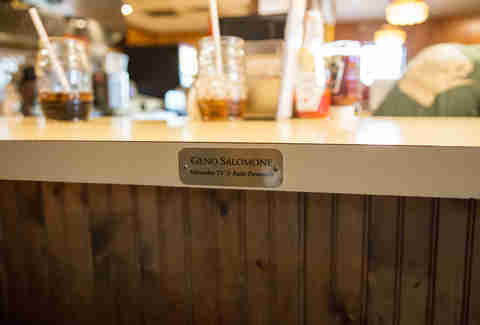 Not long after that, Solly renames his shop “Solly’s Grille.” Hamburger Charlie may have invented it, but Solly Salmon made the butter burger famous. 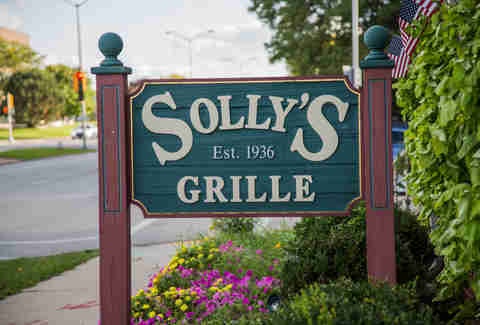 I go into Solly's around 5pm on a Monday in September with my photographer and our Chicago-based Executive Editor Matt Lynch. From the outside, with its brick exterior and nice wraparound porch, it looks less like a restaurant than the house of a transplanted Southern aunt who made good money, but mistakenly built on a busy commercial street. 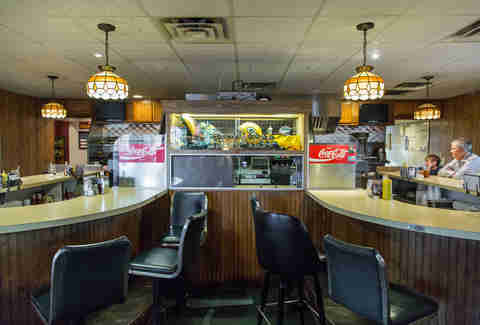 Inside, two partial oval booths jut out from the middle of the place, which is centered around a glass case filled with Green Bay Packers memorabilia and dueling soda machines offering up Dang! Red Cream Soda and Mello Yello. Stained-glass lampshades hang above, giving off a yellow-tinted (buttery?) glow. Within seconds of the burger coming out, the clarified butter is streaming from the burger onto the plate. 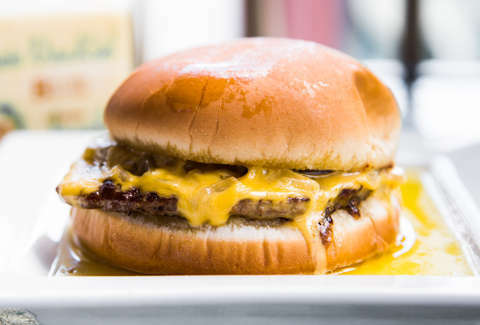 It comes out in a steady trickle, like the burger has a leaky butter faucet installed somewhere in its middle, and soon the entire plate is covered with a thin yellow layer. You might not believe me, so maybe look at this picture. I, for one, can’t really believe it. Part of me (the part that occasionally thinks about my own mortality) is horrified. It’s not enough that I’m constantly eating red meat covered in cheese and topped by buns griddled up in butter, but you actually have to put it in the meat too? Are there not laws in Wisconsin? What am I doing to myself? But the other side of me, the primal, chubby side, is literally salivating, my tongue doing the Pavlovian dog thing as I watch the butter drip down and give the bottom bun a shiny gloss. Biting into the burger is everything you might think. Butter plays into every other flavor: the fragrant fried onions, the beef, the bun. And butter just so happens to work very well paired up with each of them. It’s pretty damn delicious. One of the issues in eating a butter burger is strictly mental. You know very well that you’re eating something inherently unhealthy for you, and the buttery sheen on your lips and hands and down your chin serves as a constant reminder that you’re heaping fat on top of fat on top of fat. The other warning light comes internally. The decadence of all of that fat without an acid counterbalance slows your system, possibly even literally. Near the end of the burger, I almost started to get groggy. Your body physically tells you that you better enjoy this buttery party as long as you can, because it’s not going to be cool with it forever. And that’s fine. The butter burger is not the type you’ll want to take down by the half-dozen (though I’m sure some people of a freakish, masochistic capacity do). That seems to speak to its Wisconsin ethos as well. The people of the Cheesehead state are famously a gloriously friendly bunch, and the food/drink they do best -- the sausages, the cheeses, the ice creams, the beers -- all seem to be convivial, social foods, meant to be enjoyed in big groups, at beer gardens and beer halls and other large places that may not have beer in the name. But that excess belies a moderate spirit. And though I don’t want to sway into generalizing on a whole state’s character (though if you’re into that sort of thing, here you go! ), most of the people I know from Wisconsin are agreeable and friendly without being timid. Unlike the combative fire of my Boston upbringing, or the passive-aggression masked by an air of “chillness” I’m surrounded by now in California, there seems to be a genuine moderating desire in Wisconsin. Except maybe when it comes to these burgers. My stomach hurts. Near the end of the burger, I almost started to get groggy. Your body physically tells you that you better enjoy this buttery party as long as you can, because it's not going to be cool with it forever. Kevin Alexander is Thrillist's national writer-at-large, burger critic, and cereal photographer. Check him out in the butter aisle @KAlexander03.